The most powerful country on earth will select its next president in just four months’ time. 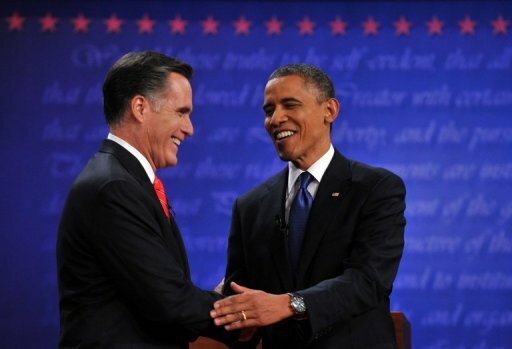 The race looks set to be between the incumbent Barak Obama and the presumptive Republican candidate, Mitt Romney. Romney has been coming under fire in recent weeks for failing to reveal his financial records but the latest polling shows the race is a dead heat. So does that mean the faltering US economy is a bigger issue that Romney’s personal finances – and one that voters are blaming President Obama for? Hywel Davies speaks to: Dr, Timothy Stanley, a historian and a writer for the Daily Telegraph newspaper; Dr Robert P. Barnidge, a Republican voter and a lecturer in the school of law at the University of Reading; James Thackara, a Democratic voter, human rights activist and the author of three novels; and Michael Cox, Professor of International Relations at the London School of Economics and Associate Fellow at the Americas Program in Chatham House, a London-based think tank.